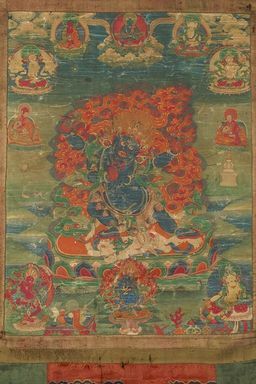 Vajrapani Bhutadamara (Tibetan: chung bu dul she chag na dor je. English: the Vajra Holder, Subduer of Daemons). Dark blue in colour with one face and four arms, the first pair of hands perform the 'Daemon Subduing' mudra (hand gesture) at the heart. The second pair of hands hold a vajra upraised in the right and a lasso in the left. Very wrathful in appearance with large bulging eyes and hair flowing upwards like flame he wears jewel and snake ornaments and a lower garment of tiger skin. On the back of the white daemon Aparajita - with four hands and an elephant head, he stands atop an orange sun disc and multi-coloured lotus surrounded by the orange and red flames of pristine awareness fire. At the top center is Akshobhya Buddha with red Amitabha and white Ushnishavijaya to the left and Maha Vairochana and White Tara on the right. Below those on the right and left are two Sakya lamas wearing monastic robes. At the bottom center is Panjarnata Mahakala with red Kurukulla on the left and yellow Vasudhara on the right. Vajrapani Bhutadamara is found in the Kriya, Charya and Anuttarayoga tantras.